Based on the classic children's novel comes a magical story about the boundless limits of imagination and the power of believing in yourself from the production team of Kungfu Hustle. When 11-year-old Wang Bao discovers a mythical, magical gourd while fishing, he has no idea of the trouble that lies at the end of his hook. Experience all the laughs and adventure of The Magic Gourd as it attempts to make all of Wang Bao's dreams comes true but succeeds in turning the young boy's world upside down! You don’t need to be a genius to figure out that the Disney Company is already aiming at the lucrative China’s market given its huge population. It’s a cash cow waiting to be milk. And what better way to win the hearts of the citizens other than infusing local cultures into Disney productions and to take a step further, customize one for the market. “The Magic Gourd” was born under such circumstances. 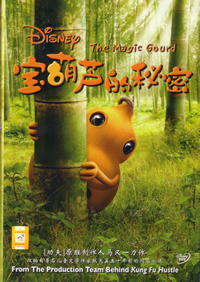 The basis of the story came from a children book by the late Zhang Tianyi almost 50 years ago and production was undertaken by HK based effects house, Centro Digital which did the CGI for “Storm Riders” and “Kungfu Hustle” since the story revolves mainly around a boy and a magical gourd which came to life. Newcomer Zhu Qilong plays Wang Bao, a schoolboy who rather dreams of flying into space than concentrate on his academics. A fishing trip at the lake yields him a magical gourd which could assist to make any of his wishes come true. The other actor who got credited on the DVD cover is none other than HK actress Gigi Leung who plays Bao’s teacher, a minor role which our local actress Chen Liping can play with her eyes closed and perhaps even better than Leung. Depending on which angle you are coming from, Disney and Centro Digital plays it safe and predictable here. There are enough boisterous CGI sequences liked soaring over the clouds, a wild dinosaur chase to overwhelm the kiddos. You can’t forget the usual motivating theme and educational message either. Some of the sequences reminiscent of Pixar’s “Toy Story” and “Meet the Robinsons” but don’t place your bets on the CGI though, it’s a notch above the usual crops of Asian movies, however still lacking behind the Western counterparts. “The Magic Gourd” plays it so safe that it actually lacks a certain surprise to the whole children genre. It’s so safe that parents didn’t even bother to bring their children to the theaters when it was released last summer in the Mainland. You know what? The filmmakers and Disney should take a cue from the adventurous Magic Gourd or Hulu (in Mandarin) instead of taking the usual trampled route. Sorry this reviewer does not know who is Baby Zhang. But she did possess a ‘baby’ angelic look and she has a cutesy voice and that’s explained why she gets to sing the theme song of “The Magic Gourd”. This 28 minutes making-of-feature covers interviews with directors John Chu, Frankie Chung, Zhu Qilong, Composer Peter Kam and snippets of behind-the-scenes on how they shot some of the sequences. That’s basically wrapped up the extra features of this Code 3 DVD. This DVD comes only in Mandarin but subtitles include English/Thai/Chinese/Bahasa/Malay. There are no apparent flaws with the visual and audio 5.1, in fact the transfer is very much of high standards perhaps due to its higher production values.